Always hunting down new ways to grab people’s interest and collaborate creatively, Lesley-Anne Evans began experimenting with Flash Poetry on Facebook in January, 2014. Flash Poetry is Lesley-Anne’s name for a new way of spontaneous creative activity, like yarn bombing, or flash mobs! But with words. With an open call out to her Facebook friends, Lesley-Anne invited them to post word bits for a set time period. Lesley-Anne harvested said words, allowed a theme to emerge, and dissected, molded, and wrote more words and phrases into a new poetic context within a fast turnaround time. The completed poems were posted back on Facebook with appropriate credit given. Flash Poems now number at seven, with the eighth call in progress until midnight tonight. Drop by and like the Flash Poem Facebook Page HERE. Follow the flash. Read the poems. Participate in the Flash Poem #8 Event HERE. But only until midnight today! Flash! Bam! 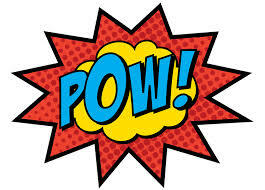 Pow!